Preheat the oven to 325°. Season the veal all over with salt and pepper. Heat the olive oil in a medium ovenproof skillet. Add the veal and cook over high heat, turning once or twice, until browned all over, about 4 minutes. Add the sliced garlic cloves and marjoram sprigs to the skillet and roast the veal in the oven for about 45 minutes, turning the meat once or twice, until an instant-read thermometer inserted in the center registers 135°. Let the meat rest for 15 minutes. 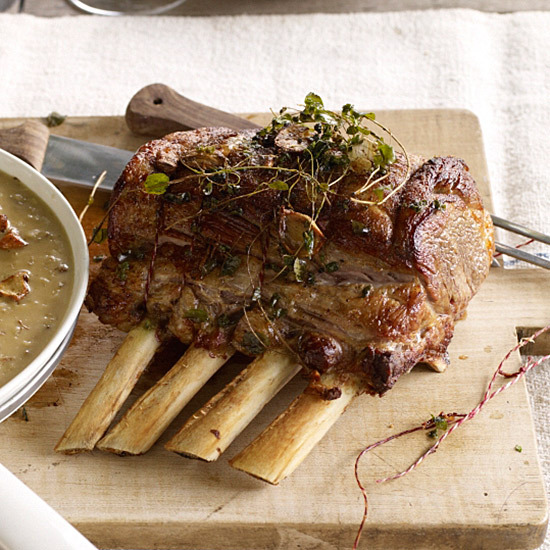 Fragrant marjoram and the risotto's earthy mushrooms point this veal roast toward an equally earthy red wine. In Switzerland, that might mean Dôle, a Pinot Noir and Gamay blend. In Italy, that could mean a more robust wine, like Lagrein from the Alto Adige.